Do you have trouble nodding off to dreamland every night? Who knew you could be so tired yet unable to fall asleep at the same time! 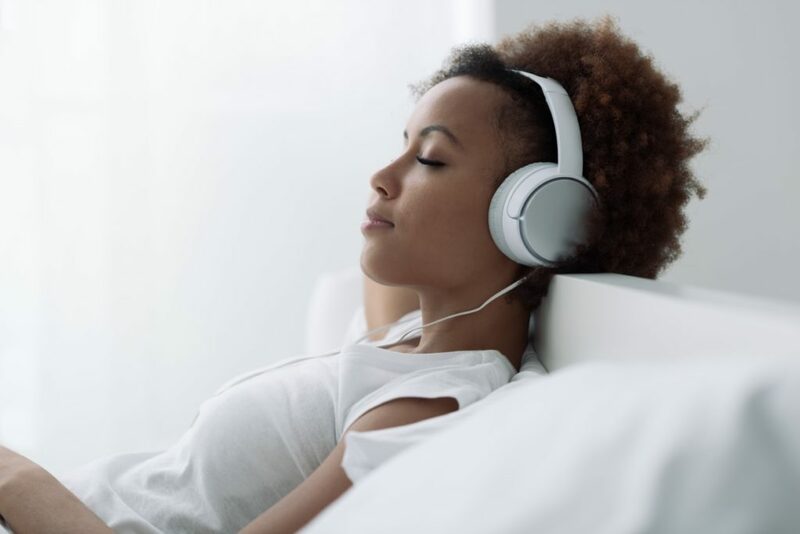 This could be a number of things wrecking your beauty sleep: an uncomfortable mattress or even a lack of a bedtime routine, to name a few. If you’re struggling to sleep, no need to worry just yet! We recommend creating a healthy nightly routine to help refresh your sleep-deprived state and also testing out our Concept Zzz mattresses. Attempt a good night’s rest with these structured habits and you too may be able to get an ideal amount of sleep for once. If you go to bed when you want and wake up when you want, that’s a red flag right there. Creating a schedule helps your body’s internal clock find consistency, which means it will naturally get tired at the same time every night and help you wake up at the same time every day. It’s a rather helpful tool when trying to fall asleep at a decent time. Everything you consume affects your sleep. From nicotine to caffeine, to even sugar and alcohol, your snoozing may have to wait while the effects of these wear off. To prevent yourself from staying up until the wee hours in the morning, or just having an awful and disruptive sleep, try to consume very little of these, or do it earlier in the day. Not to mention, if you drink a lot of ANY liquid before sleep, you’ll just end up waking up and booking it to the bathroom. So, moral of the story: plan what you eat and drink accordingly. You’ve all heard that “Cleanliness is next to godliness,” so cleaning your room should help you sleep like an angel, right? Well, sort of. Keeping your room clean and organized can help immensely when it comes to you getting some good shut-eye. Unless you love living in chaos, most people don’t like being surrounded by piles of clothes on their Concept Zzz mattress or crowded bedside tables. Most of the time these messes stress people out, making it hard to sleep well. The solution would be to not only clean up your room, but to also make it a soothing place to sleep. Get curtains or shades that block the morning light from coming in, and make sure your room stays a cooler or warmer temperature depending on your preference. Whatever you do, make your room a place that leaves you feeling calm and relaxed. Just like your body needs consistency to help it fall asleep at the same time every night, creating rituals before bed will help. 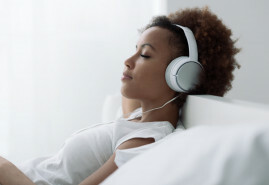 It could be as simple as lighting a candle and reading a book, listening to calming music, or another way that helps your body know that it’s time to chill out. Try to stay away from watching TV before bed because that has a tendency to keep you awake. The goal is to settle down, not get hyped up by watching your favourite action flick on Netflix. Create a habit that helps you get into the sleepy mindset so your body will be ready to pass out as soon as it hits the sheets. We want you to get a good night’s rest, and sometimes that takes more than adding a couple sleep habits to your routine. Sometimes it means purchasing a new mattress because your current one is just not fitting your body right anymore. Stop by our store to check out our Concept Zzz mattresses today, and we’ll help guide you to the one that’ll get you snoozing in no time! You see front load and top load washing machines everywhere but can’t help wondering what the difference is between these two very similar appliances – you’re not alone. Most people just choose a washing machine based off what’s trendy or what they’re used to. While they’re both helpful in their own ways, there’s quite a bit that’s different between the two washers. What it comes down to is price, ergonomics, energy efficiency, noise level, capacity and more. It even depends on if you prefer the way one looks over the other. 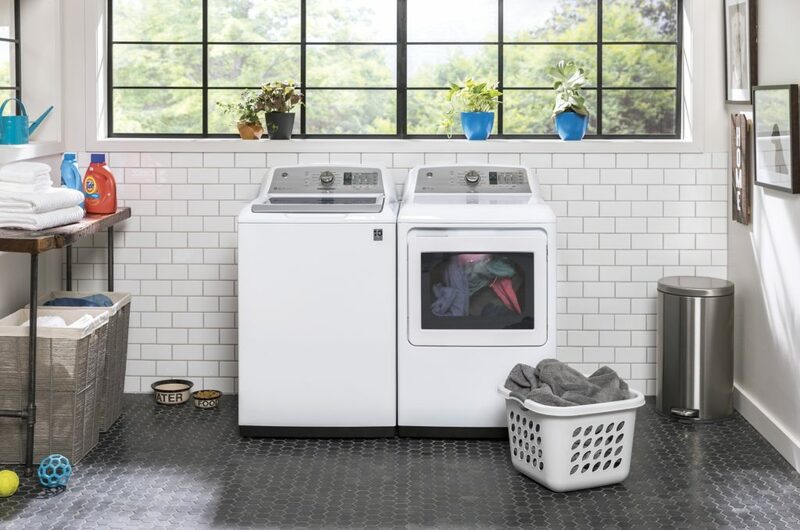 Learn more about these GE Front and Top Load Washing Machines to help you decide which one you should go with. 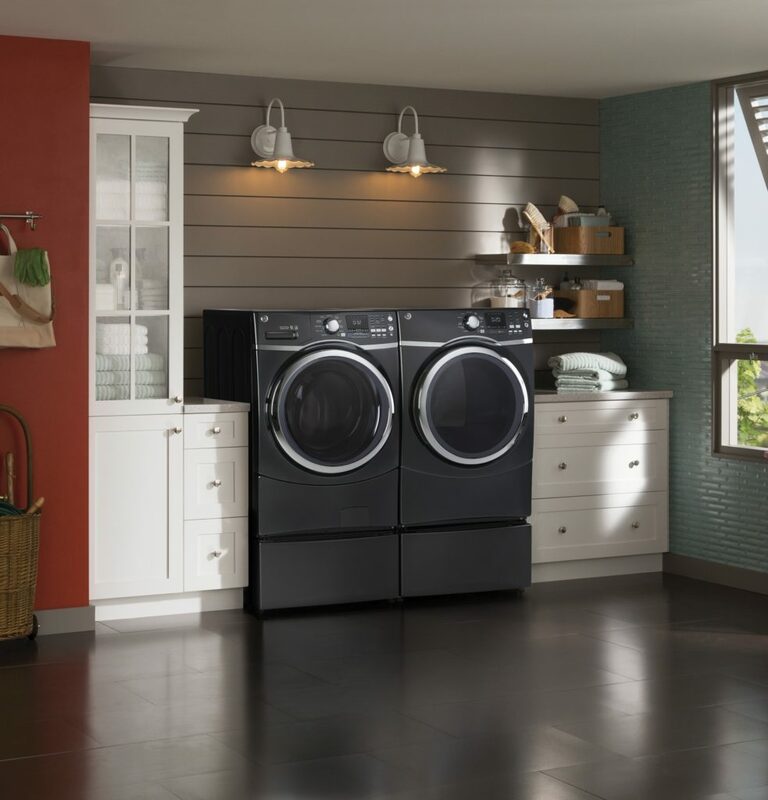 GE Top Load Washers are in no way cheap appliances in the way that they perform or look, but they’re usually less expensive than a front load washer. This may be the better option for you if you’re wanting to save some money. Another pro to owning a top load washing machine is avoiding strain on your back. With the heights of the washer being just above your waist, you never have to bend down and put stress on your joints. If you’re wanting a cheaper and more ergonomically friendly option, the GE Top Load Washer would be the appliance you’re looking for. One of the best parts about owning a GE Front Load Washer is its incredible water and energy efficiency. If you’re worried about racking up a big bill, paying a little more for a front load washing machine at first will save you loads in the future. It’s normal for washing machines to use about 35 gallons of water during a single wash, but with a GE front loader, you’ll find that half that amount is being used per wash. Not only that but if your back hurts from loading and unloading clothes into the front part of your washer, all it needs is a little lift to fix things. 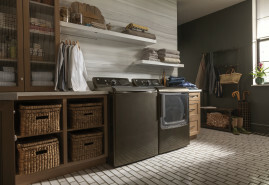 With the help of the GE pedestal, you can add both height and washing capacity to your GE appliance. 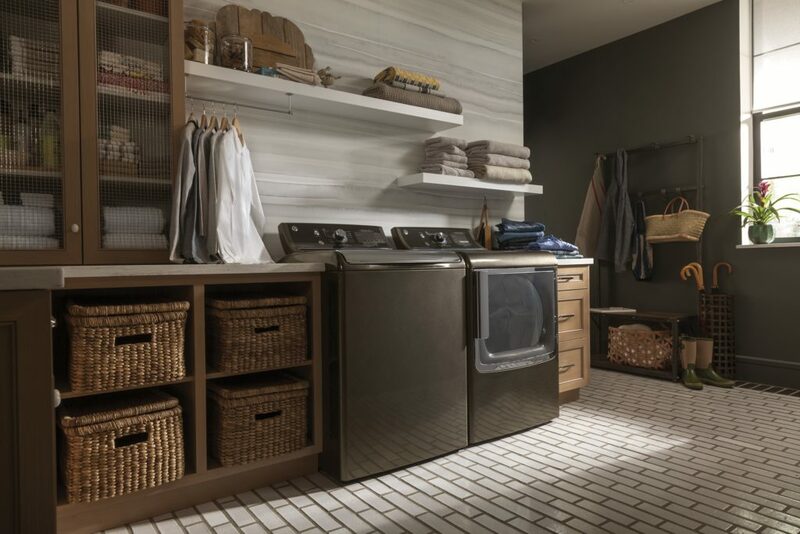 If you’re wanting a washing machine with more load capacity and with better energy efficiency, a GE Front Load Washer would be the appliance you’re looking for. All GE Washing Machines are equipped with innovative features, making it hard to just generalize between top load washers and front load washers. It’s important that when you are searching for a washer, that you take the time to look at some in person so you can get a better feel of what you want. Come by our store to take a look at all kinds of GE Washers and accessories. If you have any questions, we’d be happy to explain and give you more information on what sort of benefits you can expect from each feature. Drop by our appliance store today and you could be walking out with a brand-new GE Front or Top Load Washing Machine that is best suited to you! 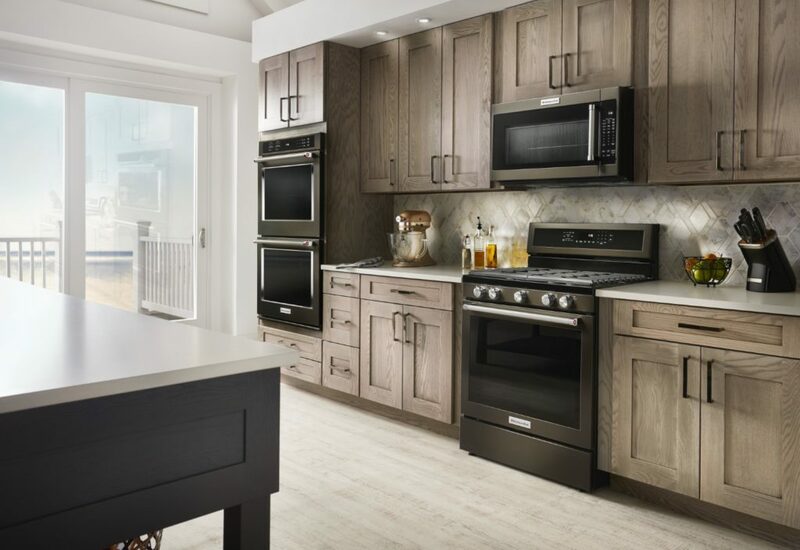 When you’re picking out a new KitchenAid range, you want to make sure you get the perfect appliance to fit your – and your kitchen’s — needs. KitchenAid offers plenty of options to choose from, but freestanding and slide-in ranges are the two basic styles. So, what’s the difference between the two, and how do you decide which one will work best in your kitchen? We’ll break down the differences between slide-in and freestanding ranges, and help you decide which one is going to be best for your next purchase. The primary differences between slide-in and freestanding ranges are style and convenience. 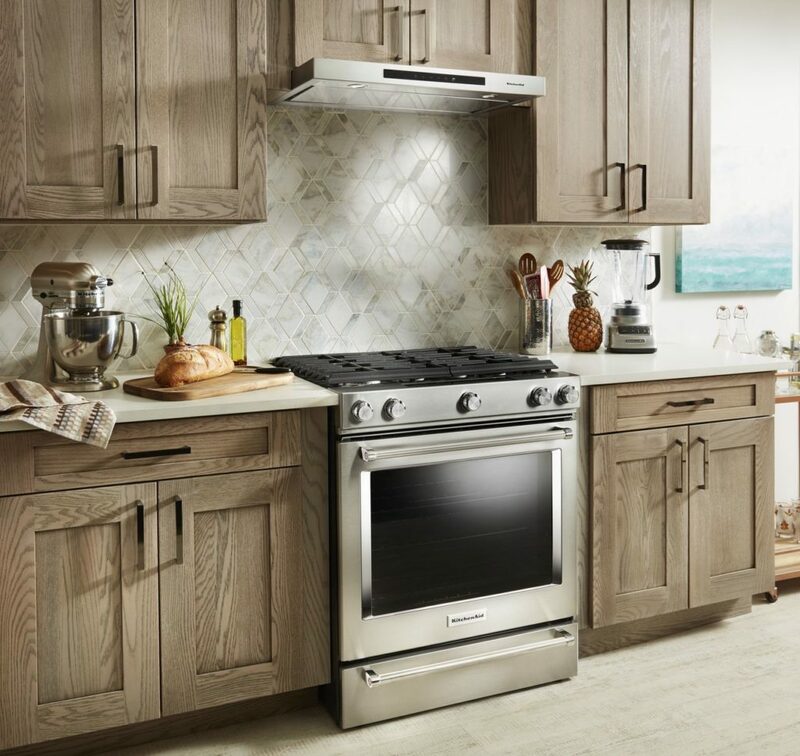 Freestanding ranges are the most common type — controls for the oven and cooktop are located on a built-in blackguard that extends up against the wall. Most kitchens are configured for a freestanding range. 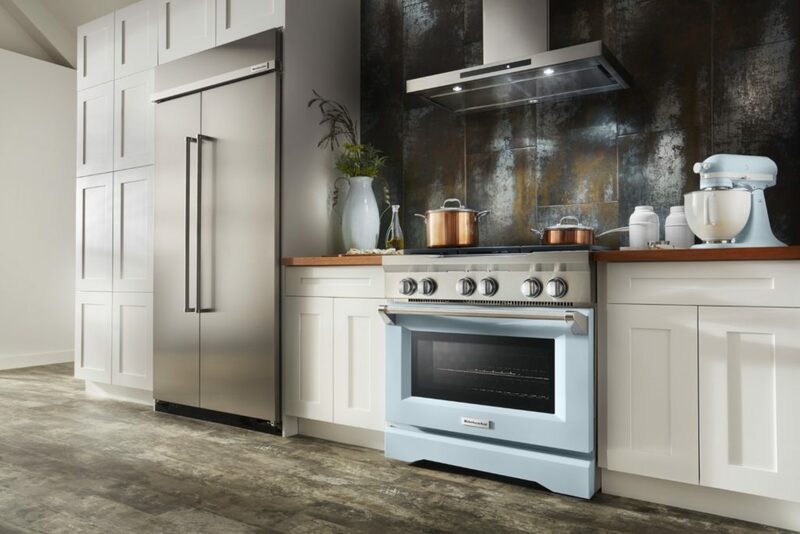 Slide-in ranges tend to be more stylish — controls for the stove and oven are on the front of the appliance, allowing for a more seamless blend with the counter, the backsplash, and the rest of the kitchen. Why Buy a Freestanding Range? Freestanding ranges are more common, so you’ll typically find more options if you decide to go with a freestanding model. The abundance of freestanding range options means you can be choosier with other stove functions, without limiting your options. Most kitchens are already configured to fit a freestanding range, making them a more convenient option if you don’t plan to do any major remodelling. Freestanding ranges are several inches deeper than slide-in ranges, so if you’re thinking about switching to a slide-in range from a freestanding model, keep in mind that you will also need to install several inches of countertop behind the range to fill that gap. Sticking with a freestanding range can be simpler, faster, and let you keep the rest of your kitchen the same. They also tend to be more affordable, so if you’re remodelling on a budget, a freestanding range might be the best option. Why Buy a Slide-In Range? If style is your primary goal, a slide-in range makes for a sleeker, more natural look. They’re designed to blend right in with your countertops and create a built-in look. If you have a custom backsplash, a slide-in range without a backguard will let you better display tilework and other kitchen décor above the range. A slide-in model can also help keep your kitchen cleaner — most slide-in ranges include a lip that fits over the countertops on both sides, to prevent crumbs and oils from collecting in crevices. Slide-ins can also provide some extra safety and convenience during the cooking process — because the dials are all on the front of the unit, you don’t have to reach over hot burners to get to the controls. Ultimately, the choice between a freestanding and slide-in range depends on your tastes, budget, and kitchen design. Both types have comparable cooking strength and offer options with more burners to maximize your cooking space. 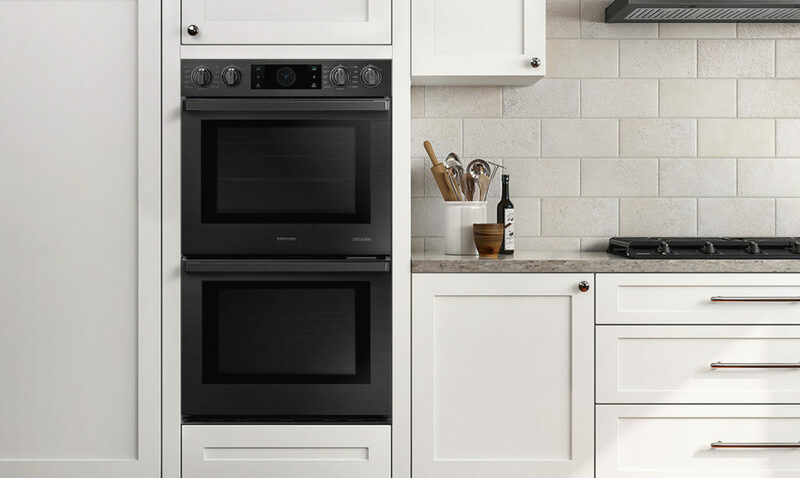 These guidelines can give you an idea of what to expect when you’re shopping for your next range, but with KitchenAid, you’ll be in good hands regardless of which type you decide to buy. You’re in the process of upgrading your kitchen, and you’ve already taken care of the fridge and dishwasher. But there’s something left. Something that can heat up things slowly at high temperatures. Something that can bake and broil. Something that rhymes with, oh what was it again, smoven? Yup, it’s officially oven time. There are different oven types, but today we are going to focus on wall ovens. Deciding anything more than that can be tricky though, especially with all the options that you have. The type of oven you ultimately end up with depends on your specific needs, and nobody is going to know what those are better than, well, you! 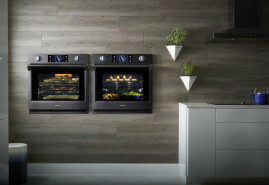 But, to help guide you through this appliance laden ordeal and help make your shopping and buying experience as easy as possible, let’s take a look at some of Samsung’s different wall oven options, and from there you’ll get a good idea of what you need to fill that oven-shaped hole in your heart … and your kitchen. Are you looking for an oven that does everything an oven does, but then some? How about an oven that has all the cooking properties that you expect from an oven, but that also has some micropowers? Samsung’s 30” combination microwave wall oven from their Chef Collection is just what the kitchen doctor ordered, then. Available in fingerprint-resistant black stainless steel — or regular stainless steel — this oven comes with a microwave attached right to the top of it. You can cook two birds with one stone, er, oven! This oven has two convection fans, which means that your food will cook faster. It also has a whole host of other features, such as Wi-Fi connectivity, steam cooking, guiding light controls, and gliding racks. Maybe you entertain a lot. Maybe you enjoy making batches and batches of cookies at the same time. Maybe you cook a lot of pizza pie. Or maybe you drew the short straw and have to host Thanksgiving dinner for both sides of the family at the same time this year and need to prepare an unholy amount of turkey. Gulp. Don’t worry. Samsung has your – and your Thanksgiving plans’ – back. 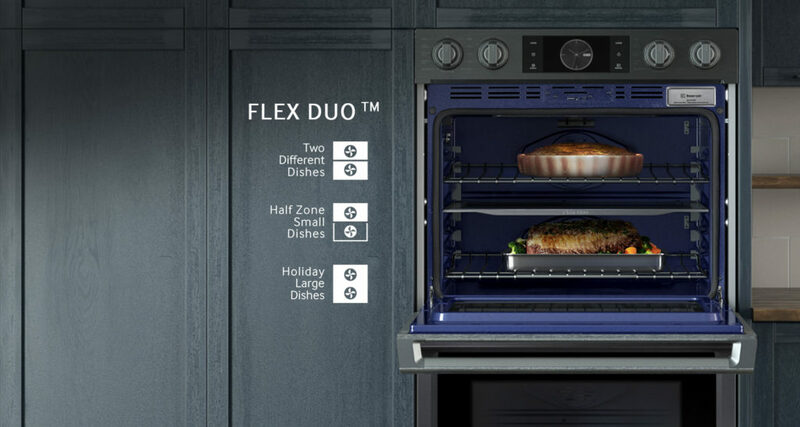 The 30” double wall oven with Flex Duo is not one, but two ovens. 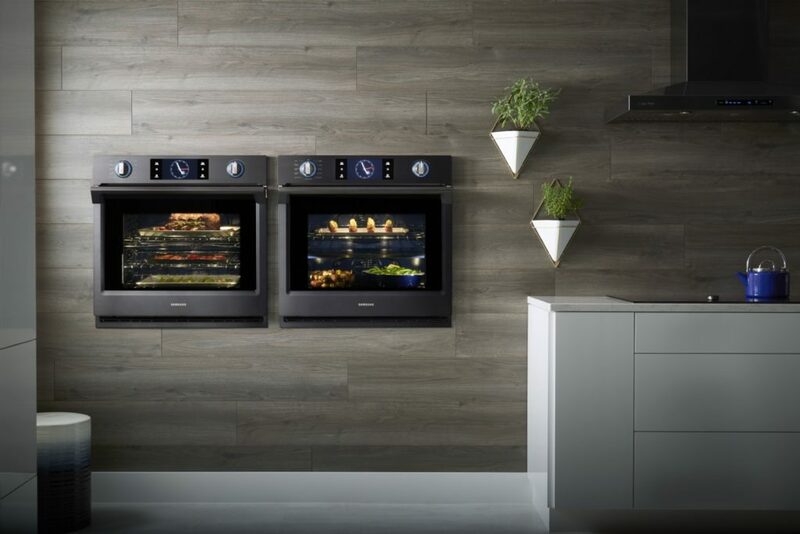 The top oven of this winning duo can be divided into two different cooking areas to cook different dishes simultaneously with different temperature and time settings, or together. A fingerprint resistant finish and Blue LED Knobs further propel this oven into the awesome futuristic-appliance category. We’re pretty sure it’s the oven they use on the Starship Enterprise, but you probably shouldn’t go double check that. Maybe you already have a microwave, or you don’t feel the need for having multiple ovens! That’s just fine. Nobody is here to judge your oven needs or wants. This is an oven-judgement free zone. Samsung also sells a 30” single wall oven. It has the same dual convection fans of the combo oven and also has wi-fi connectivity. 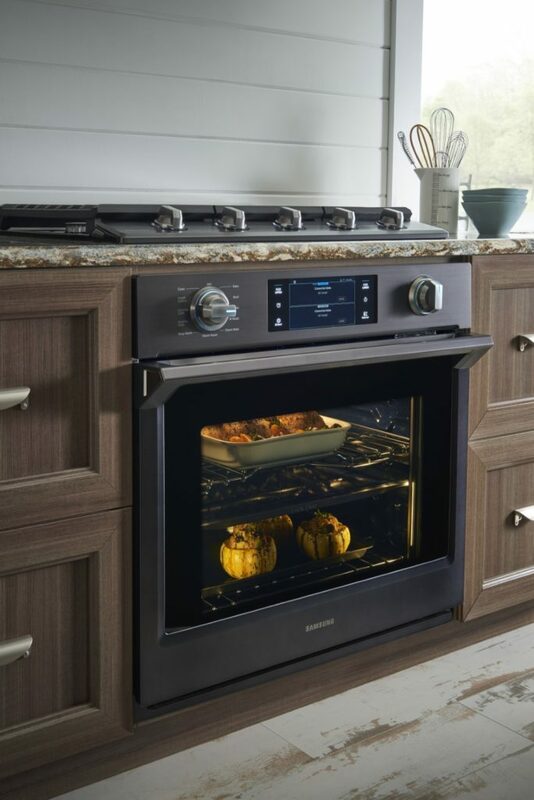 Don’t forget: If you have any questions about Samsung wall ovens and all the great things they can do for you, stop in today and we’ll be glad to walk you through the different models we have available and how they can turn your oven-game up a few notches. Worrying about bugs being in your bed is an awful feeling. Your sleeping time should be relaxing and healing, but if you’re too busy being concerned with bed bugs, it’s rather stressful. Your health can be affected and get worse due to the lack of sleep and even the bed bug bites. Keeping bed bugs out of your bed is the easy part, but once you have them, they’re a lot more difficult to remove. 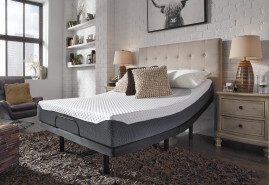 Don’t let your sleep space get to that point and follow these steps to ensure you never, ever, have to think about bed bugs taking over your Beautyrest mattress. Bed bugs are small, and they use this to their advantage. They tend to fit into small crevices, such as power outlets as a safe way to get around. It’s a good idea to cover your power outlets so bed bugs don’t have the ability to travel throughout your house. If you happen to get some of these nocturnal nasties in one room and your outlets aren’t covered, there’s a good chance they’ve already made their way to other rooms in the house through the power outlets. Get your outlets covered, and you can at least prevent an outbreak from occurring in other rooms in your home. Simply cleaning your house could be the best way to prevent bed bugs from being in your home. Bed bugs are scavengers by nature. They go after crumbs, messes, other dead bugs, and basically anything they can get their little insect hands on. If you sweep, vacuum, and mop your house, leaving little on the ground, bed bugs are less likely to be interested in your things. Be sure to keep your house squeaky clean, and you’ll probably be very successful at avoiding the swarms. If you tend to be a bit of a hoarder, bed bugs are going to love you. Just like cockroaches, bed bugs like to find small crevices, where they can hide, keep warm, and lay their eggs. When there are boxes or piles of clothes everywhere, it’s like a bed bug’s dream. Beat the clutter by reorganizing or getting rid of some things. The sooner you know you have bed bugs, the sooner you can act on getting rid of them. While you can do all that you can to prevent them from even entering your house, it’s always a good idea to at least know what it looks like when an epidemic may be on your hands. Check your body for bites, which will look like little red bumps that tend to be in a line. They’ll be a little itchy and act a lot like a mosquito bite. As soon as you see this occur, call an exterminator to nip this infestation in the bud. 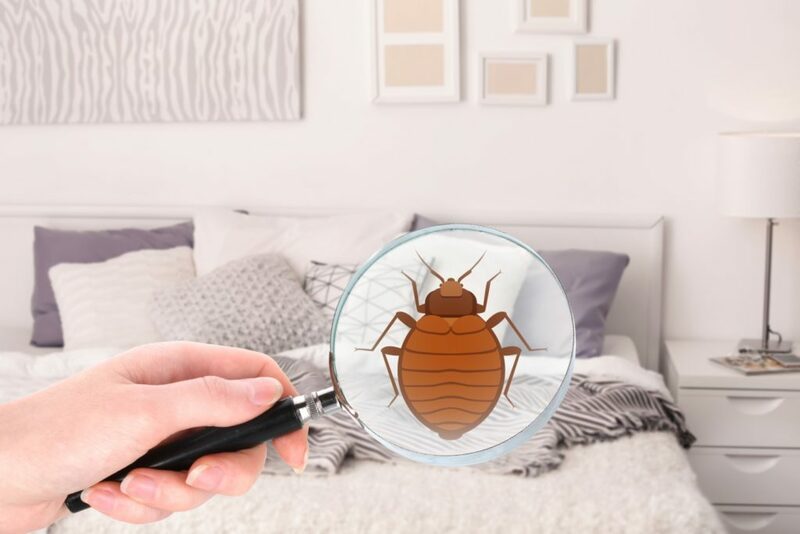 The earlier you try and actively prevent bed bugs from getting on your mattress, the better your chances at avoiding them altogether. Sometimes bed bugs are just attracted to dust, sweat, and more from old mattresses, which means you may benefit from getting a new one. 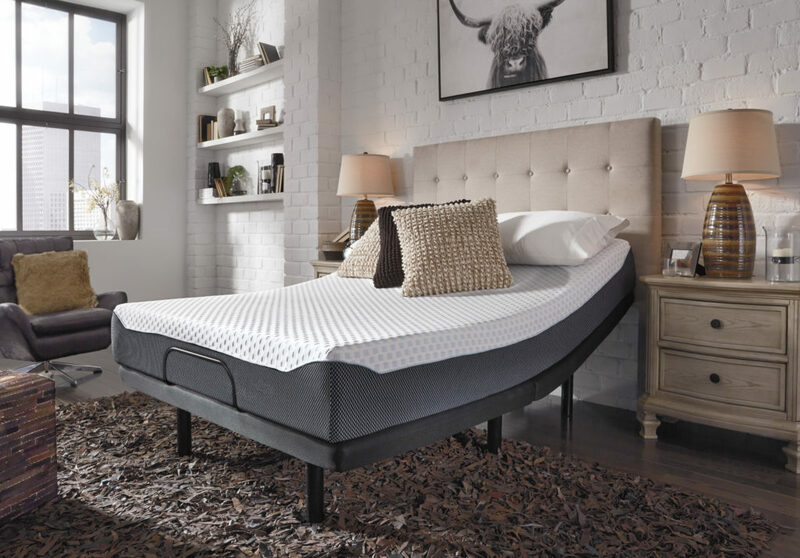 Visit your local mattress store today, to find a Beautyrest mattress that will help you in your battle against the bed bugs. We’re rooting for you! If there is one thing we can always use more of, it’s time. Doing dishes by hand or having a faulty dishwasher appliance can add to the stress of having no time, which is why having a dishwasher that works well is life changing. No more taking an hour to do a massive load of dishes – just put them away when they’re done being cleaned. 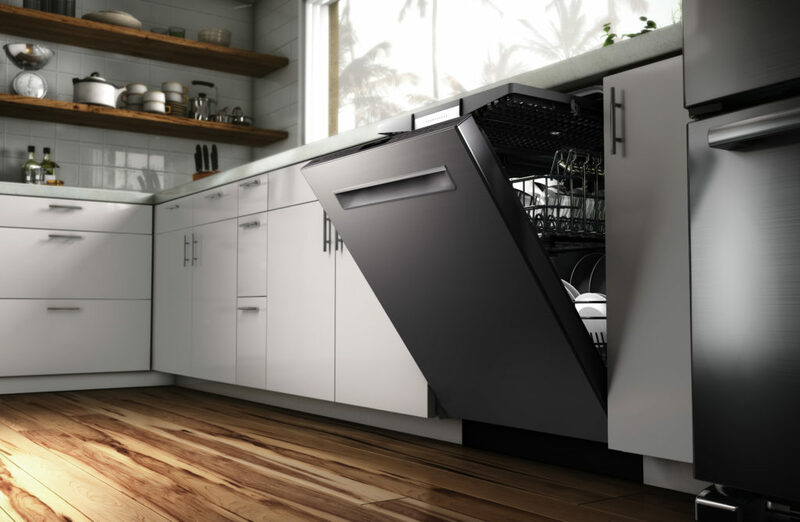 While there are a lot of great dishwashers out there, there is one brand of dishwashers that really stands out among the rest – Bosch. Is it because of the water and energy saving? Is it the enormous size of the kitchen appliance and how its extra rack allows for more items to be cleaned? Maybe it’s how quiet it cleans, that you don’t even realize it’s on. You could say that’s exactly why Bosch Dishwashers are top notch. Saving money is always a good thing, but when it is done in an environmentally friendly way, it’s even better. Bosch Dishwashers tend to use less water per cycle than other dishwashers while still getting tough food off dishes. Having an extra rack in your dishwasher allows for more utensils and dishes to get cleaned in one cycle. No more waiting for one load to finish so you can put the rest of the dirty dishes in there. Get it all done in one load! When we say quiet, we mean almost silent. Who wants a noisy dishwasher interrupting your dinner party or even your “you” time? With Bosch dishwashers, you can start a load and forget about it in peace. Looks don’t mean anything for dishwashers; it’s all about what goes on in the inside that counts. That’s not to say Bosch dishwashers look rough around the edges – au contraire! From built-in to stainless steel dishwashers, Bosch dishwashers come in an array of styles, but they never stop looking sleek. Whether you are looking to save some cash, wanting some extra room, or just need a little peace and quiet, Bosch dishwashers prove to be everything you could want and more. Visit your local appliance warehouse and talk with a sales associate to find the right Bosch dishwasher for you. Maybe you’ve decided it’s time to organize your wine collection in something other than a kitchen cabinet. Maybe you’re tired of your wine not lasting that long because it’s not sitting at the correct temperature. If you don’t feel like your reasons are justified for splurging on a Danby Wine Fridge, we can give you 4 substantial ones to just go for it. A Danby wine fridge is a small price to pay for perfection. If you are a wine enthusiast, a small wine fridge is just what you need without going overboard financially. 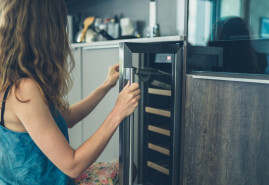 Creating a cellar is a lot of work and is made mainly for storing wine while a wine refrigerator has the ability to be used for other beverages in mind. Like we said before, unlike wine cellars, wine fridges can be used for all kinds of beverages. From soda water to beer, you can store most chilled items in a wine cooler. When it comes to milk and other milk-based beverages that need colder temperatures, keep them in your refrigerator. While they may be ok in your wine cooler, it’s best that they aren’t stored there for too long. Move it wherever you want! 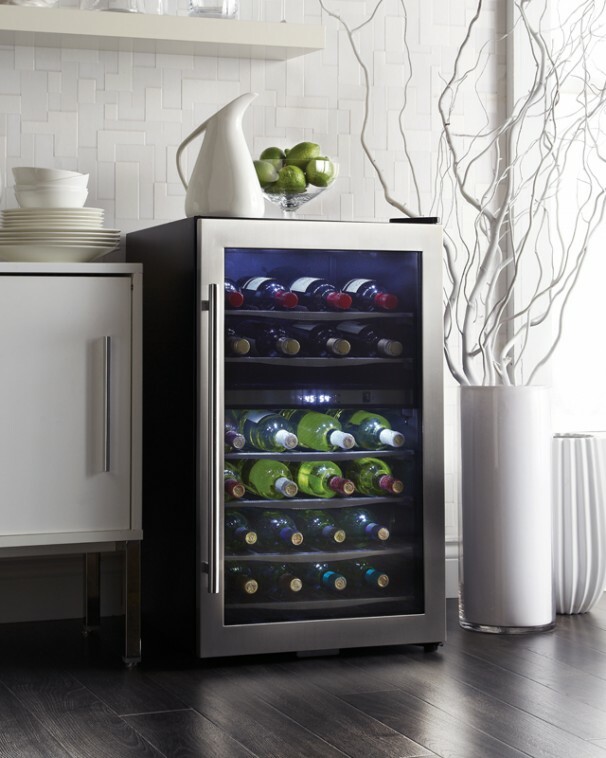 A Danby wine fridge can be put under the counter, built in, and moved anywhere you need. This is especially great for those times bottles of wine are needed for social gatherings, you can just bring your wine cooler along! 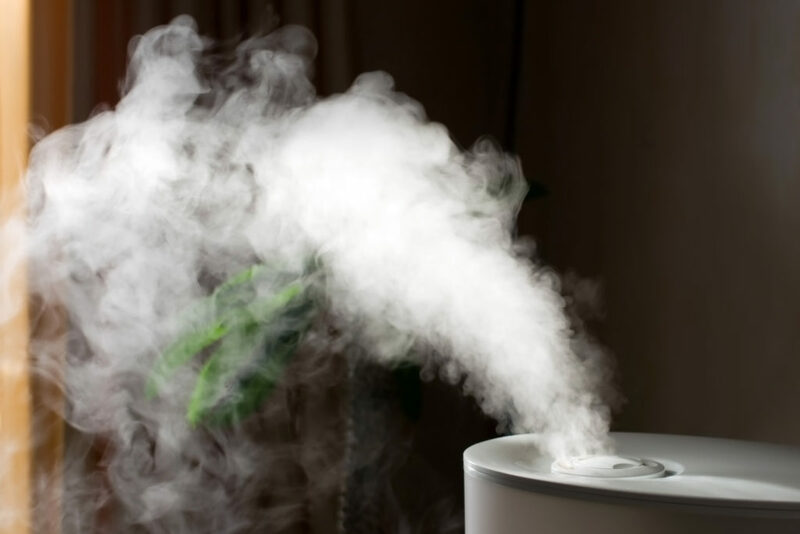 One of the main reasons to get a wine fridge has to do with the perks of temperature control. 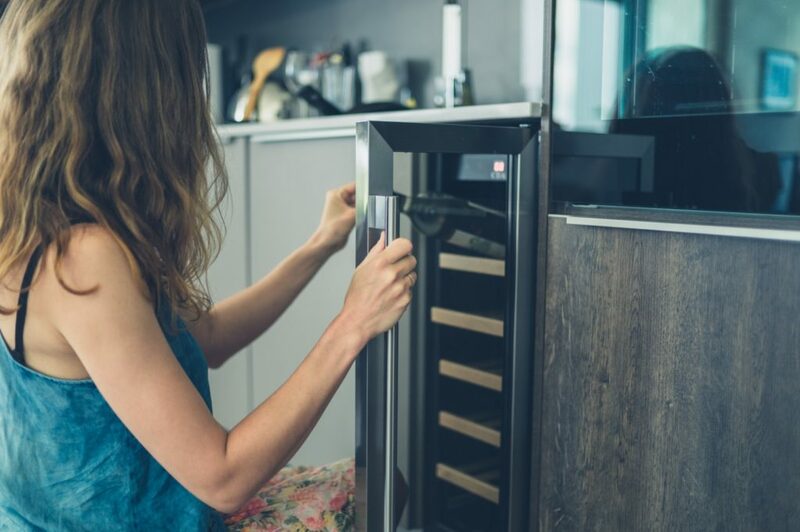 The Danby under the counter wine fridge can have up to two adjustable zones, which is ideal for keeping red and white wine at the appropriate temperatures for serving or potentially for maturing at 12 degrees for a couple of years. The Danby wine refrigerator is an appliance made for not just wine enthusiasts, but for anyone who enjoys a beverage at the perfect temperature. You’ve heard the hype about convection ovens, but you don’t really understand why. It’s just a regular oven, right? Nope. 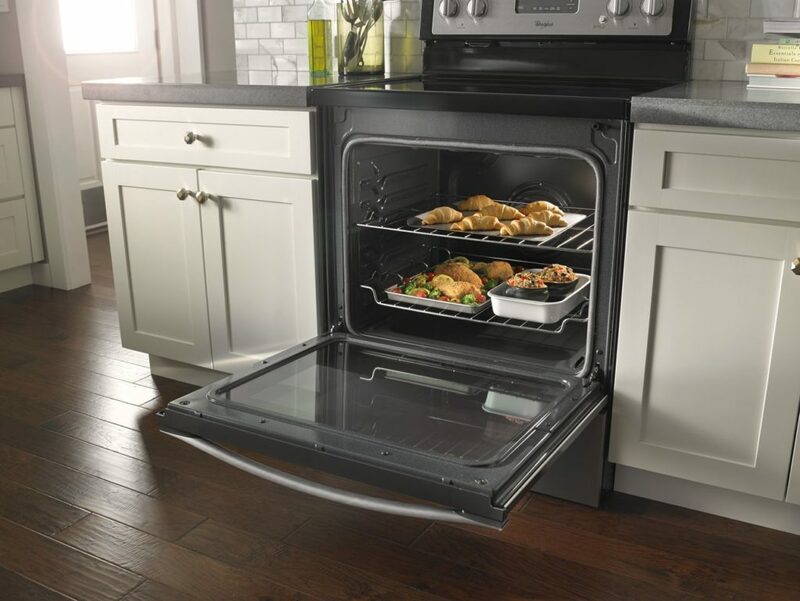 A Whirlpool convection oven uses the power of fans and heat to ensure you have a more evenly cooked meal. Not to mention, you can roast a whole chicken in 45 minutes! 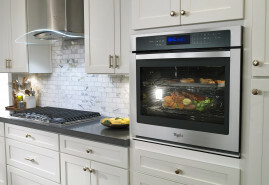 The benefits of having a Whirlpool convection oven are numerous and each amazing. If you love cooking, then a convection oven is the next kind of oven you want for your kitchen. 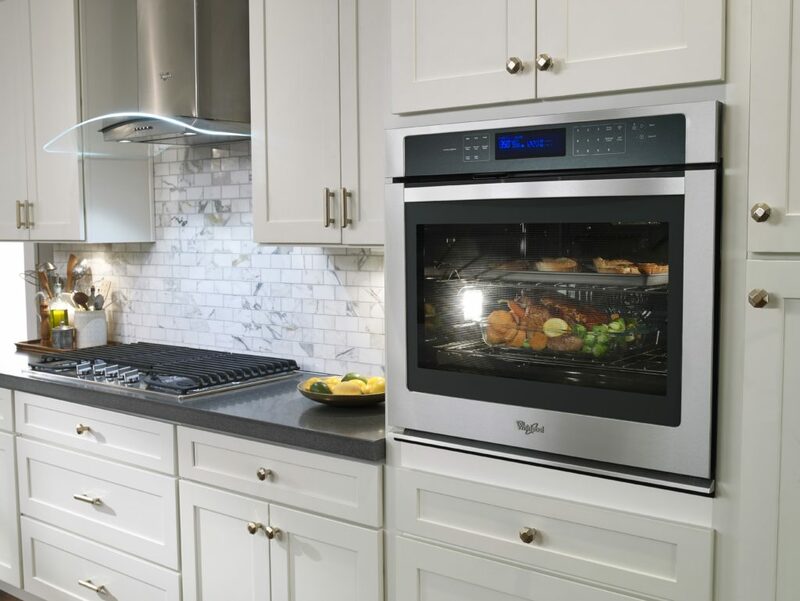 Check out some perks below on why a convection oven will make your cooking dreams come true. Like we stated above, a convection oven has the ability to roast a chicken in approximately 45 minutes. That’s fast! While it depends on the size of your chicken, a conventional oven takes on average an hour and 15 minutes to 2 hours and 45 minutes. Can you imagine what other foods you could get cooked in such a short amount of time? 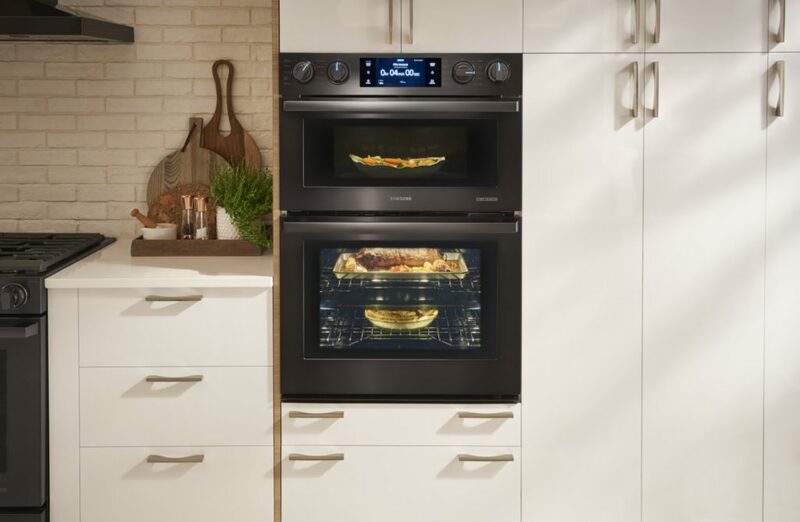 A Whirlpool convection oven heats food inside and out to seal in flavours, using a fan to circulate air for even temperature. Cakes and other desserts are less likely to be runny in the middle which means you won’t always need to stick a toothpick inside it to check its consistency. The quicker you can cook or bake, the faster you can be done and enjoy what you’ve created! When using a Whirlpool convection wall oven or range, there isn’t usually a need for a very high temperature for cooking food. The combination of a low temperature and a quick cooking time generally means the overall energy used is kept to a minimum. And if you love to cook, then it’s always a nice perk to save money on your utility bills. Ok maybe you can’t cook EVERYTHING you want to at once, but if it fits in the oven you can. If your appetizers, main course, and desserts fit in like a perfect Tetris game, then they can all cook in your Whirlpool convection oven at the same time. With a regular conventional oven, your meals would need to go in separately because they may need different temperatures, different cooking times, and just to be placed in different locations throughout the oven. With a true convection oven, the heat is blown around by the fan, ensuring everything is cooked evenly. We understand that using a convection oven is new and a little intimidating, but the best way to learn how to cook with it is by just jumping in and testing it out! Start out by making something easy – like chocolate chip cookies, for example. Experiment with them by putting them in the convection oven for a shorter amount of time and at a lower temperature to figure it out. If you are a lover of all things cookery, a Whirlpool Oven with True Convection is the next best step to reaching precise cooking and baking. Visit our store today to find a Whirlpool convection range or wall oven that will fit into your kitchen and benefit your lifestyle.